So back a few weeks ago, someone asked me to do a tutorial on building a 3D space environment that would react with other 3D layers and a camera. I was kind of stumped on achieving this nicely without using a 3D application so I decided to try something new: using images. Usually, I would create everything using Trapcode plugins such as Particular and Form to create stars, nebulas, particles, etc but I never got a chance to mess with images and make them come to life. 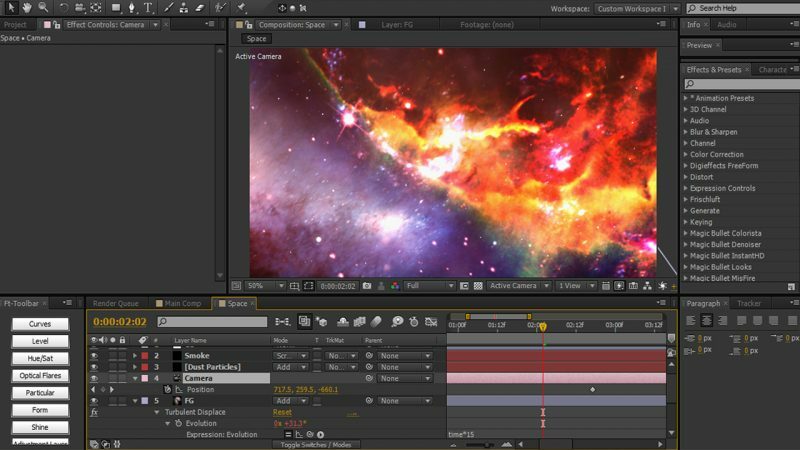 In this tutorial, we’ll be diving into After Effects and taking a look at how we can build a semi 3D space environment using a few public domain images from NASA. We will take a look at a few different ways to add some movement and animation to our flat images and create a fake parallax effect. To finish it off and blend everything together, we’ll mess around with some of the blending modes, add our own 3D particles and smoke using Trapcode Particular, and color correct! Although there are a few minor (or major) limitations to this, it does create a nice effect depending on what you need it for and it’s fun! My apologies for being very unorganized and skippy, this was one of those ‘sit down and go through it’ kind of tutorials. Hopefully you’ll learn something and have a little fun while you’re at it. Don’t forget to do major color correction and add your own little taste to everything. If you have any comments or questions, feel free to leave them below! What do you need help with Alex 🙂 Thanks for the kind words! Hi Vinhson! Thanks for the awesome tutorial! Really great effects. Im having trouble getting particular to show up in my 3D camera. It shows when I have no camera enabled, but when within the 3D comp, through the camera Particular is invisible. Do you know any way round this? I’m not quite sure what you’re trying to explain, but perhaps your camera is way into Z space and you can see your particles. Make sure the actual Particular layer is a 2d layer. You can also try expanding your Emitter in all axis to spread the particles out. Hi Vinhson! Thankyou, that sorted it out!